“What is more, even the EU is now recognising that RoHS doesn't cover everything that it needs to cover,” added Dr Brigden. If Greenpeace claims that it is disingenuous for Nintendo to continue to refuse to engage with the environmental campaign group, what would they recommend that the Japanese games company do to increase their rating in the 'Guide to Greener Electronics'? “Secondly, ‘producer responsibility’ - meaning their responsibility to tackle electronic waste. This should ideally be tackled through a global take-back policy. Nintendo has no policy on take-back that we can find on their websites or anywhere else,” said Dr.Brigden. “Note that this does need to be free takeback. The idea being that companies need to be responsible for their own waste, as that will then feed back into their own policicies regarding use of toxic chemicals,” he explained. In future rankings Greenpeace also plans to focus more on energy use, something which could well gain Nintendo an environmental plus point, as the Wii manufacturer is clearly ahead of Sony and Microsoft in this area. “Certainly the Nintendo Wii uses far less energy than the Xbox 360 and PS3,” said Dr.Brigden. 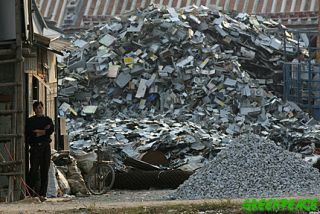 Most worryingly, Dr. Brigden informed us that a massive 75% of electronic waste in the EU is currently unaccounted for. “A large amount of this is ending up in unregulated recycling yards in India and China, which leads to extensive environmental damage.